1. Walk every day with a weighted pack in the shoes you’re going to hike in. 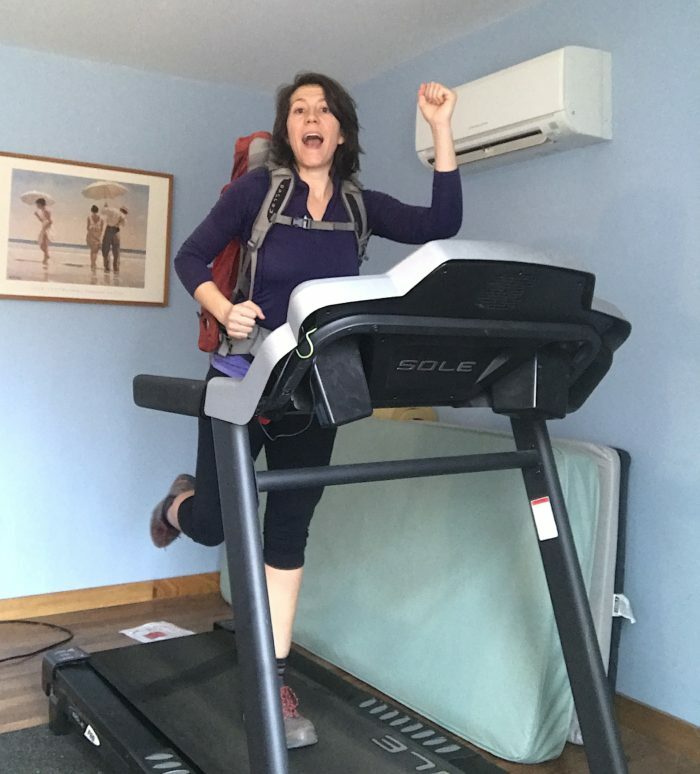 I’ve been reading social media and blog posts by other aspiring through-hikers who are training by going on runs and doing other forms of cardio. While I guess that’s better than doing nothing, you must train with weight or you will be very sad once you get on the trail. The great news is that you can fold this into your daily life. Walk to work or school with your laptop, books and a few water bottles stuffed into your pack. Walk to the grocery store and then walk home with your loot. Etc. Me training on an inclined treadmill since it’s icy and snowing where I currently am. 2. If you don’t already know what shoes work for you, go to a running shoe store. Not all feet are created equal. I’m just going to say it–despite the fact that Altras and other zero-drop shoes are super trendy amongst thru-hikers, they don’t work for everyone! (But maybe they’ll work for you if you do a better job than I did at training in them?) Go to a running shoe store and ask them for help deciding. In the months preceding my AT through-hike, I went to at least three different shoe stores. 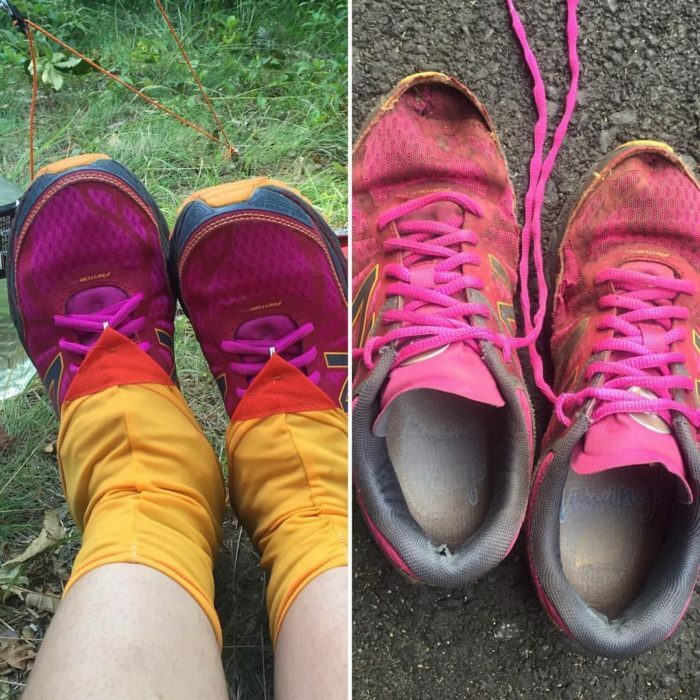 They had me try on various trail runners (because who wears boots on a through-hike anymore?) and walk around the store while the employees carefully watched. One place even made me walk on a treadmill and filmed it, so we could play back the tape in slow motion to analyze my gait. ALL of the employees warned me to use highly-supportive trail runners with insoles because of my pronation and high arches. But I ignored them and started out hiking in no-support Altras because I had read blog posts raving about them and subsequently drank the thru-hiker Kool-Aid. Doh! I paid for that mistake for 2,200 miles. Trust the experts. They know what’s up. After dating 5 different types of trail runners on the AT, I married New Balance Leadville’s. Left: new in PA. Right: dumpster-worthy in ME. 3. Strengthen your ankles daily by spelling the alphabet with your feet. 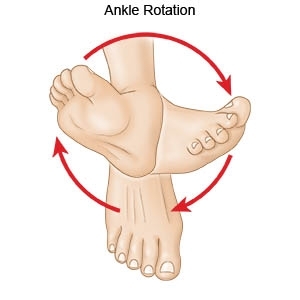 I don’t know about you, but I roll my ankles all the time due to weakness caused by previous ankle sprains. I seriously rolled an ankle every other a week on the Appalachian Trail (once because I was texting while hiking. F*cking millennials, right?!). But I religiously did ankle exercises every day at camp, which I believe prevented any of my “rolls” from being serious sprains. Here’s how it works: sit in a chair and lift one leg up so it’s parallel to the ground. Point your foot and spell the letter “A” as if writing it in the air with your big toe. Then, write the letter “B.” Then, “C.” You know the alphabet, right..? Good! Keep going until you get to “Z.” Then do the same thing with your other foot. You can also do this standing up with added benefit for your quads and knees. 4. Do toe raises while squatting and while standing. I was surprised at first by how challenging it is to raise and lower your body with just your toes–especially while squatting low to the ground. I find that doing toe raises barefoot has the most benefit. You can feel so many muscles in your feet working that you hardly use otherwise! Apparently, some of our foot muscles are under-developed because of the sturdy footwear we’ve grown up with in our culture. Well, now’s the time to strengthen them! 5. Get a bosu ball and balance on it. Balancing on a bosu ball is great because it forces your body to constantly make a million little micro-adjustments, thus strengthening many of the under-utilized muscles in the feet. This is awesome training for your feet and ankles, which are about to navigate thousands of miles of terrain filled with rocks, roots and other hazards. Fellow hikers: what are you doing to physically prepare now that our start dates are rapidly approaching? Please comment below and help this post be a better resource! Thanks and see ya out there! *Another recent Trek article to check out if you want recommendations for full-body workouts is “Physical Preparations for a Thru-Hike” by Megan Landstine. Visit janelhealy.com to follow my PCT 2018 fundraiser hike for girl empowerment nonprofits. Fantastic article, thank you. I’ve been wanting a bosu ball forever for my dog to work on and now I have a good reason to get one. I’m reassured by this article because I ran cross country in high school and I was always fitted to Asics by running stores and have stuck with them since, and am choosing to start my through hike with them rather than trail runners. Sounds like I’m doing the right thing. Yep, stick with what works! Thanks for commenting and good luck! Great article! I too will be going against the grain and NOT wearing Altras. Gasp!!! I found Brooks Cascadia shoes are perfect for me. I am going to try the foot alphabet exercise now too. I’m already doing cardio on the treadmill, dayhikes with my loaded pack (except food) and bodyweight exercises like core work and squats. I’ve done multiple overnights, a 10 day shakedown and once winter has loosened it’s icy grasp I’ll do more multiple day hikes until I leave for the AT in April. Have fun on the PCT! Great, it sounds like you’re taking training seriously. Good for you. And yes, many people seem passionate about their Brooks Cascadia’s! I found the newer models too narrow in the toe box, but it’s great you found what works for you! Good luck! Really great post! Thanks for sharing this with us. I too am busy preparing my body and especially my feet for finishing the AT this year (500 miles done, a pause to let tendinitis and plantar fasciitis heal, 1700 miles to go). The video was excellent. I already do several foot exercises, but this gave me quite a few new approaches. I plan on doing these exercises at least 3Xweek now. I do want to mention that some of us DO still wear hiking boots. I have found that I get tendinitis much more easily in trail running shoes, no matter the brand. Plus, the thicker soles of my trusted Lowa Renegades help protect the bottoms of my feet so much better. To each their own. Thanks, Ruth! I was kinda joking about the boots…I was poking fun at through-hikers, who like to get on board with the newest trends, one of which is trail runners (specifically Altras). I’m glad you found the shoes that work for you and that you found this article helpful! Good luck! Great advice. However, a communication speacialist the feels the need to curse, as all younger people do, as part of their standard vocabulary is disappointing. I guess I’m just too old to accept it. I appreciate your feedback. Thanks for being honest. You pretty much convinced me to get up to the running shoe store closest to my house and let them look at my foot mechanics before my next hike. 🙂 … Since I’m in Florida and there is ZERO elevation change, I did a lot of stairs to prepare my legs for my last section hike. I’ve since started doing calf raises regularly and I discovered that “suicides” on the basketball court work REALLY well for my thighs (which didn’t get as much prep as I thought they would from the stair climbing). 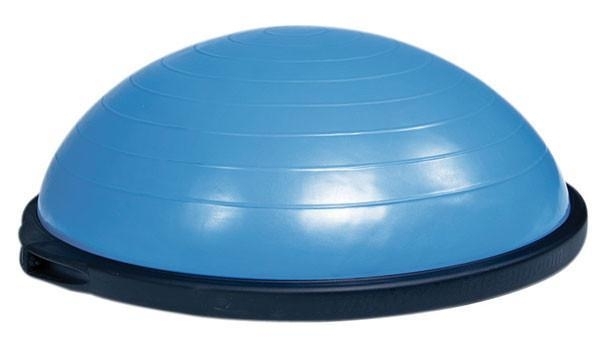 The Bosu ball was a good idea and I bet an INDO board would be another tool that would help feet and ankles (fair warning: good balance will help with that one… or if you need to learn to balance, this would force the issue). Hi! I’m glad the article was helpful for you. I love INDO boards! Great idea.